Symphony Z10 comes with 5.7 inches IPS Display 2.5D Display. It has an 13 MP camera on the back and 16-megapixel front camera for selfies, featuring with Auto HDR, Face beauty, Panorama, Auto Portrait (Bokeh), Auto Scene Detection, Auto Night Mode. Symphony Z10 Price BD is 15990 BDT. Symphony Z10 powered by 3 GB of RAM and Quard-core 1.4 GHz processor. It comes with 32 GB internal storage which upgradeable up to 128 GB by a standard MicroSD card. This dual-SIM phone supports two micro-sim. The smartphone has a 2900 mAh Li-poly battery. Talk time Up to 20 hours and standby time up to 480 hours. Symphony Z10 perated by Android Nougat 7.1.2 and no java supported. The dimension of the phone is 151.6 X 73.3 X 8.7 mm and gross weight is 159.6 gram. This smartphone comes with two beautiful colors black and grey . Fingerprint, Geomagnetic Sensor, G-Sensor, Proximity Sensor, Light Sensor, Accelerometer Sensor available on this smartphone. Chinese brand smartphone Symphony has introduced by Bangladeshi owned company Edison group in 2008. The group is already well founded in various sector like, technology, communication, power, real estate and electronics. SB Tel Enterprise Ltd is the first sister concern established in 2005 by EDISON group. From the past few years symphony is selling android operating base low and medium cost smartphone in Bangladesh. Low cost and medium rich features are the main principles of symphony. People can buy a smartphone from symphony from only BDT 2490. Currently, they have 51 numbers of smartphone and 25 nos feature phone in on going sells items. Symphony has showrooms and service center in Dhaka city and all over Bangladesh. Hope you are satisfied with our Symphony Z10 Price BD, specifications & reviews. 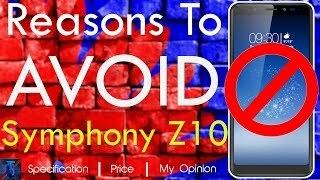 If you are one of the user of Symphony Z10 please don’t forget to drop a review by the above reviews tab. It is very important to us to know the performance of the smartphone.